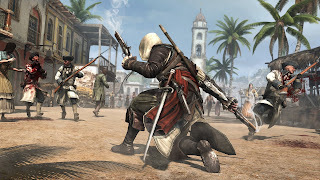 Assassin's Creed 4 Black Flag is an upcoming historical action-adventure open world video game being developed by Ubisoft.It is a sequel to 2012's Assassin's Creed III. Assassin's Creed IV: Black Flag will be released for PlayStation 3, Xbox 360 and Wii U on October 29 in the U.S., October 31 in Australia, November 1 in Europe and November 28, 2013 in Japan. The main character of the game will be Edward Kenway , a British privateer-turned-pirate and eventual member of the Assassin Order.The year is 1715. Pirates rule the Caribbean and have established their own lawless Republic where corruption, greediness and cruelty are commonplace. These outlaws paralyzed navies, halted international trade, and plundered vast fortunes. They threatened the power structures that ruled Europe, inspired the imaginations of millions, and left a legacy that still endures. Among these outlaws is a brash young captain named Edward Kenway. His skill with a sword and disdain for authority earn him the respect of pirate legends like Blackbeard, but thrust him into an ancient conflict that threatens to destroy everything the pirates have built. His fight for glory has earned him the respect of legends like Blackbeard, but also drawn him into the ancient war between Assassins and Templars, a war that may destroy everything the pirates have built. The second gameplay trailer for Assassin's Creed 4 Black Flag plunges you deeper in the fearsome life of pirates. Join Captain Edward Kenways' crew under the Black flag and explore this short but brutal period of history. This game takes you deeper into the world of Assassin's . Embark on a journey with Edward and discover his daily life as a pirate and Assassin in this Open-World demo, in a quest for glory, fame and hidden treasures.